In this edition of the Rugby Nation Show, Sean Holley is joined by Wales try scoring legend Shane Williams to announce their involvement in the Velindre Cancer Fundraising expedition to Patagonia in November 2015. 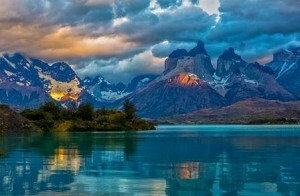 The Patagonia Trek, is organised by the Velindre Cancer Charity. It promises to be an adventure of a lifetime, a trip that will create memories that will last forever. The Trek will be a challenging, but incredibly rewarding experience, in the process raising funds for cancer patients and their families in Wales and supporting the quest to achieve Victory over Cancer. The Patagonia Trek will celebrate the 150th anniversary of Welsh settlers arriving in Patagonia. The 11 day journey will take in stunning national parks, mountain ridges, beautiful lakes, amazing icefalls and lush forests with views of the snow capped Andes. There the trekkers will celebrate to the exact day the historical climb up Craig Goch to the point where Cwm Hyfryd was first seen 150 years ago. Also on the Show in this Podcast are the usual features including Games Of The Week, StatsMad and the Sin Bin. Sean is also joined by co-host Danielle Meredith who gives her weekly local round up in Danielles Derbies.